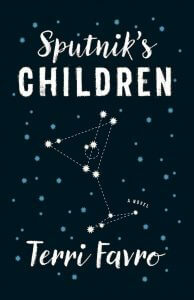 Terri Favro follows up her award-winning novella The Proxy Bride with Sputnik’s Children, a full-length debut mixing comic book science fiction with reflections of growing up during the atomic age at the height of the Cold War. Comic book creator Debbie Reynolds Biondi finally decides to tell the origin of Sputnik Chick—a character reminiscent of Flash Gordon—after 25 years of calling her “The Girl with No Past.” But there’s a slight catch: Debbie can’t just make up the story of Sputnik Chick considering a lot of it actually happened to her. Debbie grew up in Atomic Mean Time, an alternate reality where a nuclear corporation rules over everything and the Cold War is much hotter. With World War III looming and the bomb about to be dropped on her town, Debbie is recruited by time travellers to collapse the timeline and transition humanity to current reality—all while losing everyone she loves in the process. Favro’s time-travelling comic book adventure narrative is fast-paced and entertaining, especially in moments featuring alternate versions of historic events or celebrity biographies. However, while the premise and setting are imaginative, together they create a narrative suffering from the same duelling identity as its main character. The story slows down considerably when it switches to its coming-of-age in a small town narrative, resulting in the mission of the story unable to reach climax until it feels too late. At least the time spent getting to know Debbie’s friends and neighbours in Shipman’s Corners (a stand-in for St. Catharines, Ont.) makes the collapse of the timeline much more heart-wrenching. It’s also interesting to see who remains from the previous timeline. Even more intriguing: do they remember Atomic Mean Time? We won’t spoil it for you.